Detailed studies of lung pathology in patients during the course of development of acute lung injury or respiratory distress are limited, and in the past information related to lung-specific responses has been derived from the study of lungs from patients who died at autopsy or from animal models. Development of good in vitro human tissue models would help to bridge the gap in our current knowledge of lung responses and provide a better understanding of lung development, physiology and pathology. In vitro models of simple one-cell or two-cell culture systems as well as complex multicellular lung analogs that reproduce defined components of specific human lung responses have already been realized. A benefit of current in vitro lung models is that hypotheses generated from review of data from human or animal disease studies can be tested directly in engineered human tissue models. Results of studies done using simple in vitro lung systems or more complex three-dimensional models have already been used to examine cell-based responses, physiologic functions, pathologic changes and even drug toxicity or drug responses. In the future we will create models with specific genetic profiles to test the importance of single gene products or pathways of significance. Recent development of microfluidics-based models that support high-throughput screening will allow early-stage toxicity testing in human systems and faster development of new and innovative medical products. Model design in the future will also allow for evaluation of multiple organ systems at once, providing a more holistic or whole-body approach to understanding human physiology and responses. Use of lung tissue slices to identify cellular events that influence lung physiology has provided some information related to lung responses and disease development. The problems with culture of tissue slices are that human organ slices can be difficult to obtain and survival of slices is limited to a few days . Because of these problems, most researchers have utilized in vitro cell culture models to answer basic questions related to human cellular responses in the lung. The topic of engineering lung tissue and development of respiratory models has been extensively reviewed by the authors [2, 3], and this narrative is intended as an update and summary of the field. One of the earliest models used to study lung development, an in vitro culture of pieces of intact fetal lung, indicated that there were critical differences in the development of submersion-cultured fetal lung cell- scaffold constructs versus air-interface-cultured fetal lung constructs . Subsequent work focused on the construction of alveolar-like tissue structures using primary type II cells grown in three-dimensional (3D) collagen gels that supported production of surfactant proteins . Later models focused on formation of models of the pulmonary-alveolar-capillary barrier, the major anatomical component necessary for support of gas exchange in the lung . These early simple one-cell or two-cell culture models provided information related to physiologic function of cell types found in the upper and lower airways but did not allow for assessment of more complex cell-cell or cell-matrix interactions. Development of better 3D lung tissue models became the goal, and this was driven by the desire to better understand basic interactions of epithelial cells and extracellular matrix [7, 8]. Early reports by Blau and colleagues indicated that rabbit fetal lung tissue cultured on Englebreth-Holm-Swarm tumor membrane could support production of type II pneumocytes . Depending on the culture conditions, cuboidal cells could be produced that contained lamellar bodies, a characteristic marker of type II pneumocytes. Information gained from these early systems paved the way for later design and execution of more complex multicell engineered lung tissue equivalents [9–12]. Formation of human composite respiratory mucosa using normal human bronchial cells cocultured with bone marrow mesenchymal stem cells under air-interface conditions allowed for the formation of mucus-producing cells in vitro . This model of respiratory epithelium exhibited structural and functional features of tracheal mucosa such as cytokeratin production, mucus production and mucus secretion and modeled basic airway repair mechanisms, an important step in the process of developing more complex physiologic models. An exceptional physiologic model of airway mucosa used IMR-90 (human lung fibroblast) and normal human bronchial epithelial cells in a collagen scaffold [13–15]. Collagen II, fibronectin and mucus were produced in this system. This model was used to determine the role of mechanical stress on epithelial and endothelial cell development, response and survival, and provided information related to epithelial cell interactions with extracellular matrix. Studies by Cortiella and colleagues in 2006 used engineered lung tissue constructs as a developmental model to examine progenitor cell differentiation, response to growth factors and lung tissue formation. 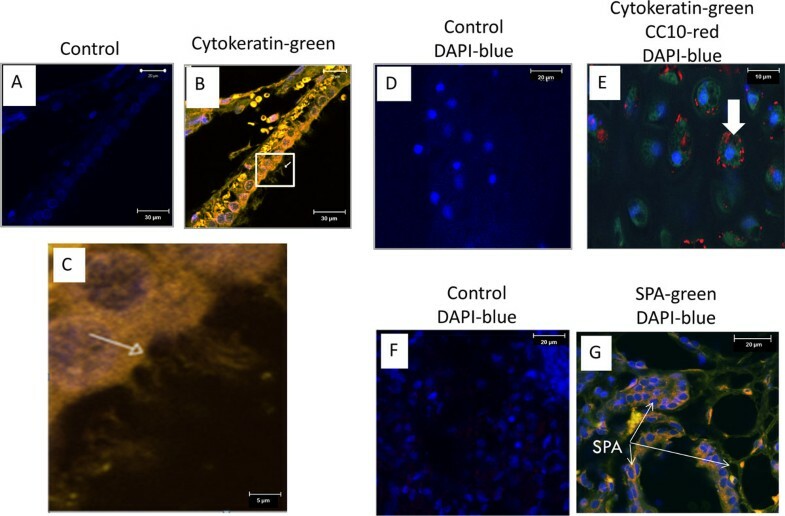 In vitro differentiation of a heterogeneous mixture of ovine somatic lung progenitor cells into pulmonary epithelium was performed on polyglycolic acid or pluronic F-127 scaffolds, producing cells expressing Clara cell protein 10, cytokeratin and surfactant protein C by immunostaining, which was validated by western blot for Clara cell protein 10 and surfactant protein C . Scanning electron microscopy of the engineered tissue constructs demonstrated organization of the cells into pulmonary structures morphologically similar to alveoli. Mondrinos and colleagues used a similar engineered tissue model to examine the differential effects of fibroblast growth factor-2, fibroblast growth factor-7 and fibroblast growth factor-10 on distal lung morphogenesis in collagen gel. Results showed that fibroblast growth factor-2/fibroblast growth factor-7/fibroblast growth factor-10 induced robust budding of the epithelial cell structures, resulting in formation of a uniform endothelial network parallel to the epithelium . Development of good in vitro models of lung disease or lung pathology has been limited. A model of airway mucosa produced from epithelial cells and fibroblasts isolated from asthmatic and nonasthmatic volunteers was used to form a human bronchi model and was an early attempt to generate a pathologic airway response system [4, 18]. Another complex pathologic model includes culture of human umbilical cord endothelial cell line with an epithelial cell line, A549, to form a two-layer construct that was used to examine early events in Mycobacterium tuberculosis infection . Peripheral blood-derived leukocytes were added to the cell layers and this immune-tissue model allowed for examination of leukocyte movement and the influence of inflammatory cytokines on epithelial and endothelial cell growth and survival following exposure to M. tuberculosis. For the generation of standardized lung models, production of lung tissue from cells derived from a renewable source such as embryonic stem cells (ESC) or induced pluripotent cells is appealing, since this offers the possibility of production of many same-size portions of 3D tissue for replicate culture and exposure under homogeneous conditions. Although 3D models of airway generated from human ESC have not been realized, the capacity of murine ESC to generate airway epithelia has been mentioned [20, 21]. Ciliated epithelial cells, Clara cells and type II alveolar epithelial cells expressing surfactant protein A with production and secretion of surfactant protein A was described by Cortiella and colleagues, and an example of the tissue development realized by this model is shown in Figure 1. These were the first reports of the capability for differentiation of ESC to produce differentiated airway epithelial tissue and were milestones in the development of engineered lung constructs from a renewable stem cell source. ESC possess the potential to produce all cell types found in the normal lung. A model consisting of 3D microgel platforms seeded with ESC that mimicked stem cell niches was used to promote vasculogenesis and patterning of tissue formation. This model provided substantial information regarding extrinsic cues provided by soluble factors or extracellular matrix at early stages of germlayer formation and embryonic development . Derivation of lung progenitors from patient-specific cystic-fibrosis-induced pluripotent stem cells has been an important step in the production of differentiated lung epithelium for disease modeling, with potential for use in the design of patient-specific therapies for cystic fibrosis or other lung diseases in the future . Production of respiratory tissue from murine embryonic stem cells on whole acellular trachea-lung scaffold. (A) Staining control, 4',6-diamidino-2-phenylindole (DAPI)-blue. (B), (C) Production of ciliated epithelial cells in the lower trachea. (D) Staining control for (E). (E) Production of Clara cells in upper bronchi of whole recellularized trachea-lung. CC10, Clara cell protein 10. (F) Staining control for (G). (G) Production of cells expressing surfactant protein A (SPA) indicating the presence of type II alveolar epithelial cells. Modified version of a figure adapted from Cortiella and colleagues . Recently a series of microfluidic 3D lung-on-a-chip models have been produced that are specifically designed to meet the high-throughput needs of drug and toxicity testing [24, 25]. These microfluidic-based in vitro devices recreate specific components of lung physiology and pathology such as air-interface responses or epithelial-capillary barriers. Microfluidic lung models have also been used to create a human disease model-on-a-chip that mimics pulmonary edema . This device was used to reproduce drug toxicity-induced pulmonary edema observed in human cancer patients. Of particular interest is the development of patient-specific 3D lung cancer systems with potential for use in the formulation of individualized chemotherapy schemes to select specific drugs or drug combinations for patient-based lung cancer therapy . The mechanism of lung injury to be studied defines the cell-type requirements and, often, the critical numbers or types of cells necessary to support development of mechanistic responses in lung models. Some human disease mechanisms are difficult to reproduce in vitro due to the complex interplay between different cell or tissue types. Traditional cell culture assays to examine toxicity or pathogenicity in two-dimensional systems are often flawed due to dependency on immortalized cell lines that do not adequately reflect biology and response of primary human cells, due to reliance on single-cell systems that fail to recognize cell-cell interactions with the microenvironment, and due to reliance on artificial two-dimensional monolayers for modeling complex diseases. Modeling a complex 3D soft tissue such as the lung is difficult since, pathophysiologically, even lung toxicity involves alveolar epithelial type I and type II cells, lung fibroblasts, endothelial cells and potentially many other cell types. Models that examine lung injury due to trauma, microbial pathogenesis or adverse drug reactions in the lung have been produced. These models generally focus on responses of the pulmonary parenchyma, the pleura, the airways or the pulmonary endothelium, and few allow for examination of complex problems such as development of lung fibrosis. Even models that examine the direct action of toxins/drugs that cause cell death, induce apoptosis, or modulate biomolecule production by lung cells do not allow for evaluation of the responses of immune that also contribute to lung damage. Because of these problems, little is known regarding mechanisms involving lung damage, lung fibrosis or metabolism of drugs in the human lung. Although a great deal of information regarding cell contact and rudimentary tissue formation has been gathered from the study of transformed and clonally related cell lines grown in either two-dimensional or 3D systems, long-term culture of these models will not be possible until microfluidic support devices are developed to provide adequate circulation of media into and metabolic waste out of these cultures. In the future, models will need to be developed from reproducible or standardized cell sources such as human immortalized adult cells, human ESC or human induced pluripotent stem cells to fit the needs of high-throughput evaluations of drugs or drug toxicity. Formation of lung-on-a-chip-based microfluidic systems will help to answer many of the questions we have regarding lung pathology and toxicology. Engineered 3D lung tissue constructs that mimic complex tissue physiology have amazing potential for use as lung physiology or disease pathology models, but models requiring large numbers of cells (greater than 5 million to 6 million per well), multiple cell populations or use of specific extracellular components or natural scaffolds are often not suitable for the generation of standardized microfluidics-based high-throughput systems for drug discovery or toxicity testing. In the future, to produce a more holistic view of human drug responses, platforms will need to be developed that support linkage of lung-on-a-chip devices with other microphysiological organotypic chips such as the kidney, heart, liver or skin. Lung on a chip type devices would allow the evaluation of the effects of toxic metabolites or physiologic waste materials produced from other organ systems on lungspecific responses, lung diseases and development of drug toxicity in the lung. This research, and publication of this article, was supported by a U18 grant from the National Institutes of Health, National Center for Advancing Translational Sciences (NCATS)[Grant No. 1-U18-TR-000560].